Everybody's having a good time complaining about the new guy. Maybe things are not really so bad. "(Feb. 11) -- As hundreds of thousands of Iranians took to the streets of Tehran to mark the 31st anniversary of the Islamic Revolution and riot police clashed with anti-government demonstrators, Iranian President Mahmoud Ahmadinejad told a pro-regime rally today that their country is now a "nuclear state." Addressing a crowd that had gathered in the central Azadi Square to celebrate the overthrow of the pro-Western Shah in 1979, Ahmadinejad revealed that Iranian scientists had produced their first batch of enriched uranium. "The first package of 20 percent fuel has been produced. We are now a nuclear state," he said." Being from Minnesota, I can tell you that Republicans are the miNority... We´re a blue state. I wonder how Dylan would feel about your use of his lyrics. 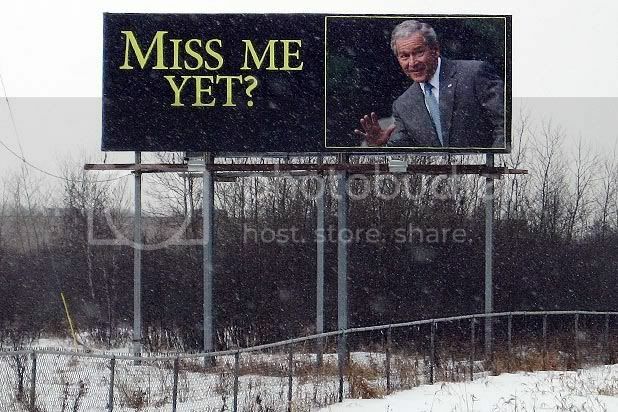 Hell no I don't miss him. In fact, I say "good riddance!" That billboard is just what we do NOT need -- more undisclosed corporate money influencing our elections. Maybe the Chinese put up that sign, who knows? I'm sure the Chinese miss Bush because they sure loved all the borrowing Bush did from them. The first 42 US Presidents amassed a total of $1.01 trillion dollars of foreign-held US debt, while good ol' Dumbya managed to amass $2.06 trillion of foreign-held US debt in his 8 years as President. He spent money like a drunken frat boy. Shameful. does anybody know if they put homosexuality back in? You won’t find too many defenders of George W. Bush’s record on spending these days, even among Republicans. But a check of historical tables compiled by the Office of Management and Budget shows that the spending that so distressed Pelosi and Reid seems downright modest today. After beginning with a Clinton-era surplus of $128 billion in fiscal year 2001, the Bush administration racked up deficits of $158 billion in 2002, $378 billion in 2003, $413 billion in 2004, $318 billion in 2005, $248 billion in 2006, $162 billion in 2007, and $410 billion in 2008. The current administration would kill to have such small numbers. President Barack Obama is unveiling his budget this week, and, in addition to the inherited Bush deficit, he’s adding his own spending at an astonishing pace, projecting annual deficits well beyond $1 trillion in the near future, and, in the rosiest possible scenario, a $533 billion deficit in fiscal year 2013, the last year of Obama’s first term. Now, under Obama, the national debt — and the interest payments — will increase at a far faster rate than during the Bush years. At some point last week, the sheer velocity of Obama’s spending proposals began to overwhelm even experienced Washington hands. In the span of four days, we saw the signing of the $787 billion stimulus bill, the rollout of a $275 billion housing proposal, discussion of Congress’s remaining appropriations bills (about $400 billion) and word of a vaguely-defined financial stabilization plan that could ultimately cost $2 trillion. When representatives of GM and Chrysler said they might need $21 billion more to survive, it seemed like small beer. Anon, the current administration is pumping money back into the economy to try to rescue us from the recession created by Bush's irresponsible policies. It's probably not enough, he should not have included any Republicans in any of the decision making. It's expensive cleaning up after eight years of disaster. "the current administration is pumping money back into the economy"
I heard somewhere 800 billion (the stimulus bill) was about the same amount of gross tax receipts from personal income tax in 2003, hey round it up to a trillion and you are at about the 2007 level. What would have you done if you could keep your money ? put in a new kitchen ? taken a US based across the country vacation ? 2007 was a year before the US economy hit the tipping point and fell into a deep recession. Only a fool would expect tax receipts to increase over 2003 in this deep recession with Bush's many rounds of tax cuts still in effect. 294.1 Anonymous trolldom, paranoid type. 294.2 Anonymous trolldom, dissociative type. 294.3 Anonymous trollodom, not otherwise specified. Ah yes, another traitor who wants their President and country to fail. "Do you think lawmakers in Washington should (keep trying to pass) a comprehensive health care reform plan, or should (give up on) comprehensive health care reform? If health care reform is dead, who do you think is mainly responsible for that - (Obama), (the Democrats in Congress), or (the Republicans in Congress)? Who do you trust to do a better job handling [ITEM] - (Obama) or (the Republicans in Congress)? Creating jobs - 48% Obama/41% Reps in Congress"
On every one of these issues, Obama is trusted more than the Grand Obstructionist Party. Oh and look at what Americans think about Miss Hopey Changey Quitter herself. "Do you have a favorable or unfavorable impression of Sarah Palin? Do you feel that way strongly or somewhat? is there a poll to find out why polls always turn out to be wrong on election day? Asked about the move by the Obama administration and top military brass to end the don't-ask-don't-tell policy, Cheney said, "I think the society has moved on. I think it's partly a generational question. I say, I'm reluctant to second-guess the military in this regard...When the chiefs come forward and say, ;We think we can do it,' then it strikes me that it's -- it's time to reconsider the policy. And I think Admiral (Mike) Mullen said that."